#1. This week's number one is former University international guard Justin Edwards (190-92, college: Kansas St., currently plays in South Korea). He led Anyang KGC to a victory over the closely-ranked DB Promy (20-21) crushing them 102-71 in the South Korean KBL in Sunday night's game. Edwards was MVP of the game. He scored 38 points (!!! ), had 5 rebounds and dished 4 assists in 30 minutes on the court; quite an impressive performance considering it's only Edwards' third season in pro basketball. Anyang KGC (18-23) is placed eighth in the KBL. It's Edwards' first year with the team. He has individually a very good season with high stats. Edwards averages: 15.8ppg, 4.1rpg, 2.9apg, 1.7spg, 2FGP: 56.1%(111-198), 3FGP: 30.6% and FT: 71.1% in 22 games he played so far. He played for the Canadian university national team six years ago. #2. Second place goes to an international point guard Kevin Pangos (185-93, college: Gonzaga, currently plays in Euroleague). Pangos contributed to an easy victory against the closely-ranked Olympiacos (12-9) crushing them 76-55 in the Euroleague in Thursday night's game. He scored 9 points and added 8 assists. FC Barcelona Lassa (12-9) is placed fifth in the Euroleague. Pangos' overall stats this season are: 7.1ppg, 1.2rpg, 3.5apg, 2FGP: 46.6%, 3FGP: 24.2% and FT: 73.9%. He has a dual citizenship: Canadian and Slovenian. Pangos is in the roster of the Canadian senior national team. #3. The Canadian player who performed third best last week abroad was former U18 international point guard Kenny Chery (180-92, college: Baylor, currently plays in France). He could not help Boulazac Basket (10-9) in their last game. Despite Chery's very good performance Boulazac Basket was badly defeated 93-75 on the road by the higher-ranked (#3) JL Bourg. He was the top scorer with 26 points (made all of his seven free throws) in 32 minutes. They ended the series of three consecutive victories. Chery has very impressive stats this year: 16.2ppg, 3.7rpg, 4.1apg, 1.2spg, 2FGP: 48.4%, 3FGP: 38.5% and FT: 96.1%(49-51) in 19 games. He played for the Canadian U18 national team nine years ago. #4. Power forward Kelly Olynyk (213-91, college: Gonzaga, currently plays in NBA) was not able to help the Miami Heat (24-27) in their last game on Friday. Despite Olynyk's very good performance the Miami Heat (24-27) was badly defeated 118-102 in Oklahoma City by the Thunder. He was the top scorer with 21 points. Olynyk also added 7 rebounds. Olynyk has relatively good stats this season: 9.1ppg, 4.4rpg and 1.6apg. He is also Canadian national team player. #5. Former U19 international swingman Trey Lyles (206-95, college: Kentucky, currently plays in NBA) was not able to secure a victory for the Denver Nuggets (37-16) in their last game. Despite his very good performance the Denver Nuggets (37-16) were crushed 129-103 in Detroit by the Pistons. Lyles was the top scorer with 20 points. He also added 4 rebounds and dished 3 assists in 29 minutes. It was Nuggets' first loss after six consecutive victories. This year Lyles has relatively solid stats: 9.1ppg, 4.2rpg and 1.4apg in 50 games. He used to play for the Canadian U19 national team six years ago. #6. Point guard Shai Gilgeous-Alexander (198-98, college: Kentucky, currently plays in NBA) couldn't help the Los Angeles Clippers (29-25) in their last game on Sunday. Despite Gilgeous-Alexander's very good performance the Los Angeles Clippers (29-25) were badly defeated 121-103 in Toronto by the Raptors. He was the top scorer with 19 points. Gilgeous-Alexander also added 5 rebounds, 3 assists and made 2 blocks. Gilgeous-Alexander has reliable stats this season: 10.1ppg, 2.8rpg, 3.0apg and 1.1spg. He is a former international player as he played for the Canadian senior team three years ago. #7. An experienced international center Joel Anthony (206-82, college: UNLV, currently plays in Liga Americas) contributed to an easy victory against the closely-ranked Mogi (0-3) crushing them 103-78 in the Liga Americas last Friday. Anthony recorded 14 points, 5 rebounds and 2 blocks in 22 minutes. It was the game of the round between two top 4 ranked teams. San Lorenzo de Almagra (3-0) is placed first in the Liga Americas. So far his team won all three games in the Regular Season. The Regular Season already ended in the Liga Americas. This year Anthony's overall stats are: 7.5ppg, 6.5rpg, 1.5bpg and 1.5spg in two games. He is also Canadian national team player. #8. Point guard Kaza Kajami-Keane (185-94, agency: Interperformances, college: Carleton, currently plays in Holland) was the major contributor in Zwolle's victory against the closely-ranked Groningen (14-6) crushing them 78-56 in the Dutch Eredivisie on Saturday night. Kajami-Keane recorded 20 points, 6 rebounds, 3 assists and 3 steals. It was the game of the round between two top 4 ranked teams. 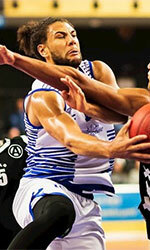 Landstede Basketbal Zwolle (18-2) is placed second in the Eredivisie. It was his team's third consecutive victory in a row. This season Kajami-Keane has very high stats. He averages: 18.4ppg, 5.2rpg, 3.9apg and 3.2spg. Kajami-Keane plays currently for the Canadian national team. #9. Former international forward Aaron Doornekamp (201-85, also represented by Interperformances, college: Carleton, currently plays in EuroCup) contributed to a 3-point Valencia Basket's victory against the closely-ranked Unicaja Malaga (3-2) 72-69 in the Eurocup in Wednesday night's game. He scored 11 points and had 3 steals in 25 minutes. 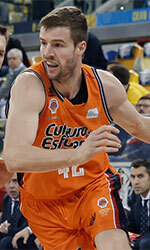 It was the game of the round between two top 2 ranked teams in group G. Valencia Basket (5-0) is placed first. So far his team won all five games in the Top 16. They will play only one more game in the Eurocup Top 16. And that game will be critical. 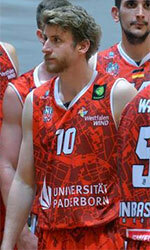 This year Doornekamp's total stats are: 3.7ppg, 2.8rpg and 1.8apg in 15 games. He used to play for the Canadian national team four years ago. #10. Forward Thomas Scrubb (198-91, college: Carleton, currently plays in Italy) couldn't help Openjobmetis VA (10-8) in their game against Dolomiti En. 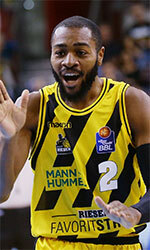 TR (8-10) in the Italian Serie A. Scrubb scored 9 points, had 9 rebounds and dished 5 assists. But Openjobmetis VA was edged 74-71 in Trento by the lower-ranked Dolomiti En. TR (#12). It's Scrubb's first season with the team. His stats this year are: 13.7ppg, 7.2rpg, 2.8apg and 1.6spg. Scrubb is an international player who is currently on the senior Canadian National Team roster. #11. International guard Philip Scrubb (191-92, college: Carleton, currently plays in VTB United League) contributed to Zenit's victory against the closely-ranked Khimki 86-82 in the VTB United League on Sunday night. He scored 12 points and added 6 assists in 32 minutes. Scrubb averaged so far 10.9ppg, 1.9rpg, 4.1apg and 1.2spg in 14 games. He plays currently for the Canadian national team. #12. Former international center Robert Sacre (213-89, college: Gonzaga, currently plays in Japan) was the main contributor in a Hitachi Sunrockers' victory against the sixth-ranked Shiga L-Stars crushing them 89-57 in the Japanese B League in Monday night's game. Sacre was the best player in that game. He recorded a double-double by scoring 23 points and getting 10 rebounds. Sacre also added 3 assists. This season he has very high stats. Sacre averages: 18.4ppg, 8.8rpg and 1.4apg. He used to play for the Canadian national team back in 2015. #13. International forward Melvin Ejim (201-91, college: Iowa St., currently plays in EuroCup) contributed to an easy victory against the closely-ranked Zenit 82-67 in the Eurocup on Wednesday night. Ejim scored 9 points. Ejim has averaged so far 8.5ppg, 3.6rpg and 1.1apg. He is also Canadian national team player. #14. 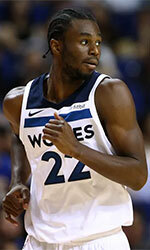 Former international guard Andrew Wiggins (203-95, college: Kansas, currently plays in NBA) contributed to a 2-point Minnesota Timberwolves' victory against the Memphis Grizzlies 99-97 in the NBA in Wednesday night's game. Wiggins scored 12 points, had 5 rebounds and dished 4 assists in 41 minutes. Wiggins has very impressive stats this year: 17.8ppg, 4.6rpg, 2.3apg and 1.1spg in 48 games. He used to play for the Canadian national team back in 2015. #15. Former international power forward Andrew Nicholson (206-89, college: St.Bonaventure, currently plays in China) contributed to Sturgeons' victory against the 12th-ranked Jilin Tigers 106-95 in the Chinese CBA last Friday. Nicholson recorded a double-double by scoring 25 points and getting 13 rebounds. He also added 3 assists. This season Nicholson has very high stats. He averages: 28.4ppg, 9.4rpg and 1.9apg. Nicholson used to play for the Canadian national team two years ago. #1. Dylan Ennis (187-PG-91, agency: BeoBasket, college: Oregon, currently plays in EuroCup) was the major contributor in Andorra's victory against the fourth-ranked Cedevita (0-5) 87-81 in the Eurocup last Wednesday. Ennis scored 17 points, grabbed 6 rebounds and dished 3 assists; not bad, considering it's only his second season in pro basketball. MoraBanc Andorra (5-0) is placed first in group H. So far his team won all five games in the Top 16. They will play only one more game in the Eurocup Top 16. And that game will be critical. Ennis has relatively good stats this season: 12.8ppg, 3.7rpg, 3.4apg and 1.5spg. He has a dual citizenship: Canadian and Jamaican. #2. Dejan Kravic (211-F/C-90, college: Texas Tech, currently plays in Italy) led Virtus Bologna to an easy victory against the closely-ranked Sidigas AV (11-7) crushing them 88-66 in the Italian Serie A on Sunday night. Kravic had a double-double by scoring 12 points and getting 10 rebounds. He also added 3 blocks in 25 minutes. Virtus Segafredo Bologna (10-8) is placed sixth in the Serie A. It's Kravic's first season with the team. Kravic has relatively good stats this year: 11.3ppg, 6.4rpg and 1.2bpg in 18 games he played so far. He is another player who holds two passports: Serbian and Canadian. #3. Nicholas Wiggins (198-SF-91, college: Z*Orangeville A's, currently plays in Argentina) led Argentino to a 2-point victory over the closely-ranked Penarol (5-8) 77-75 in the Argentinian La Liga in Thursday night's game. Wiggins was the best player in that game. He scored 22 points in 26 minutes. Argentino Junin (3-9) is placed 17th in the La Liga. But this is still an early stage of the season and everything may happen. It's Wiggins' first year with the team. Wiggins has individually a very good season with high stats. He averages: 17.2ppg and 4.3rpg in 11 games. #4. Kassius Robertson (191-G-94, college: Missouri, currently plays in Germany) could not help BBC Bayreuth (9-8) in their last game on Saturday. Despite Robertson's very good performance BBC Bayreuth was badly defeated 86-68 on the road by the higher-ranked ALBA Berlin (#4). He was the top scorer with 19 points. This season Robertson has relatively solid stats: 10.9ppg, 2.0rpg and 2.4apg. #5. Matthew Wright (193-G-91, college: St.Bonaventure, currently plays in Philippines) led Phoenix to an easy victory against the tenth-ranked Blackwater Elite (1-3) 114-95 in the Filipino PBA last Friday. Wright scored 19 points, had 7 boards, passed 7 assists and added 5 steals in 34 minutes. Phoenix Fuel Masters (4-0) are placed first in the PBA. So far his team won all four games in the Regular Season. Wright has very impressive stats this year: 20.5ppg, 6.8rpg, 4.5apg and 2.3spg in four games. He has both Canadian and Filipino nationalities. #6. Experienced Jamal Williams Jamal (196-F-86, college: Regina, currently plays in United Kingdom) led Newcastle Eagles to a victory against the league outsider Worcester Wolves 103-92 in the British BBL last Friday. He recorded 19 points, 5 rebounds and 3 assists. Williams Jamal has averaged so far 6.3ppg, 2.9rpg and 1.5apg. He also holds two passports: Canadian and British. #7. Keith Omoerah (194-G-92, agency: Interperformances, college: Manitoba, currently plays in Ukraine) was not able to help Mykolaiv (6-6) in their last game. Despite Omoerah's very good performance Mykolaiv was badly defeated 88-72 at home by the leading Khimik. He was the second best scorer with 15 points. Omoerah also added 6 rebounds and dished 3 assists in 27 minutes. Omoerah averaged so far 13.3ppg, 6.6rpg, 3.0apg and 1.3spg in eight games. He has dual citizenship: Canadian and Nigerian. #8. Isiaha Mike (203-F-97, currently plays college basketball in the States), who plays in the NCAA was not able to secure a victory for the SMU (3-3) in their last game. Despite Mike's very good performance his team was edged 85-83 on their home court in Dallas by the Wichita State University. He recorded 25 points and grabbed 7 rebounds in 28 minutes. Mike averaged so far 11.7ppg, 4.9rpg and 1.7apg in 21 games. #9. Aleksandar Danilovic (202-F-93, currently plays in Portugal) led Ovarense to a victory over the closely-ranked Esgueira / Oli 86-75 in the Portuguese LPB in Saturday night's game. He was the top player that evening. Danilovic scored 17 points and blocked 2 blocks. 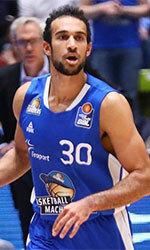 Danilovic averaged so far 13.4ppg, 5.2rpg and 1.2apg. He has dual citizenship: Canadian and Serbian. #10. Norbert Torres (198-F-90, currently plays in Philippines) contributed to a Rain or Shine's victory against the seventh-ranked SM Beermen 108-98 in a derby game in the Filipino PBA last Friday. Torres scored 15 points in a mere 18 minutes. Torres averaged so far 11.3ppg, 3.5rpg and 1.3apg in four games. He holds both Canadian and Filipino passports.